I bought bananas a week ago with the intention of eating them. They were not quite ready to eat so I put them aside…and proceeded to, completely, forget about them. By the time I gave them another thought, they were well into the ‘must bake’ stage. 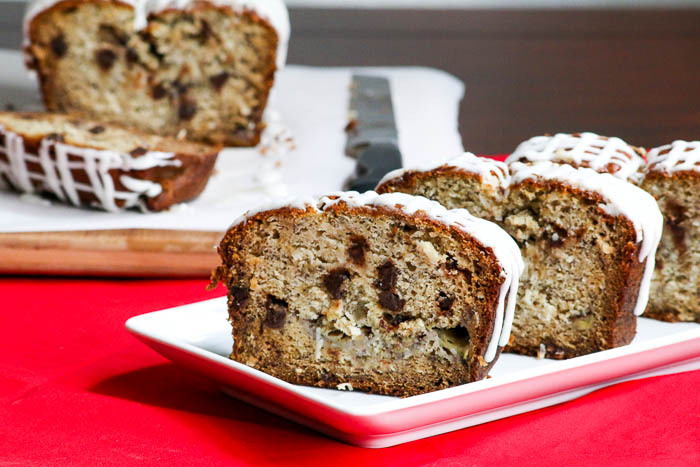 Fortunately, I had been dreaming about doing something with bananas, coconut and chocolate chips, so it wasn’t a far leap to come up with Banana Coconut Chocolate Colada Bread. I used all four bananas; two were blended into the batter and two were folded in at the end with the coconut and the chips. I call this bread because it kind of looks like one but it could, easily, be called dessert. As is usually the case when I bake, I posted different pictures on Instagram which also sends them to Twitter and my personal Facebook page. My brilliant friend Jenni from Pastry Chef Online suggested a rum glaze. It took a nanosecond to respond with, SOLD! The glaze could not be easier. It’s just stirring together confectioners sugar and rum. 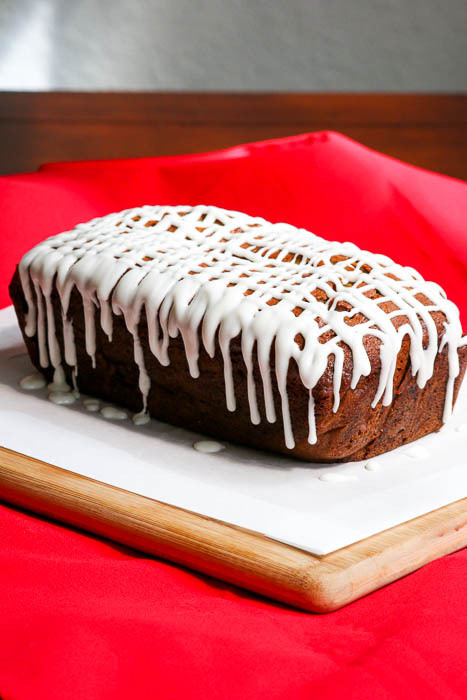 If you do not want alcohol, then make a glaze with confectioners sugar and milk or a chocolate glaze or just enjoy the bread sans glaze. As you have probably guessed, I am a huge lover of ‘kitchen sink’ recipes, the ones that seem to throw everything but the kitchen sink into them. 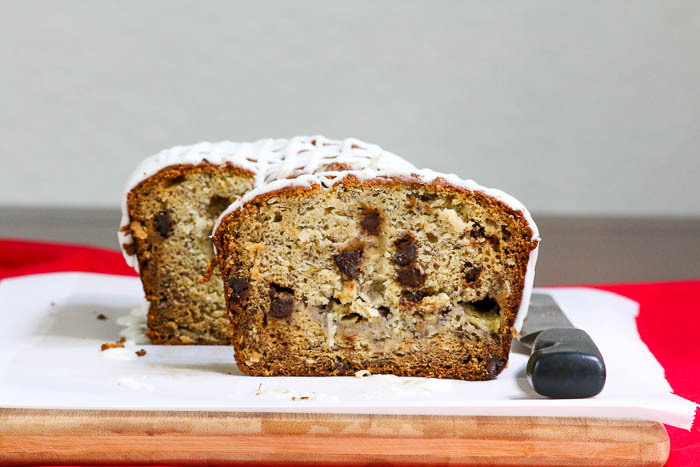 I am happy to report that this Banana Coconut Chocolate Colada Bread got rave reviews from everyone who tried it; so the odds are definitely in your favor for a fabulous treat…whether you call it bread or dessert! Preheat the oven to 350°F. LIne a 9" x 5" baking pan with parchment paper and set aside. Gently mash two bananas in a bowl so that there are still clumps of bananas. Set aside. Place the remaining two bananas, the sugar, eggs, butter and vanilla into a large mixing bowl. Beat until the mixture is creamy. Blend in the dry ingredients. Fold in the coconut and chips. Transfer the batter to the pan and bake at 350° for 1 hour. Check after 40 minutes and tent with aluminum foil if the top is getting too dark. Stir the rum into the confectioners sugar. Pour the glaze into a quart size freezer bag. Seal the bag and cut off a small piece from one of the bottom corners. Lift the bread out of the pan. Pull the sides of the parchment paper down and drizzle the glaze over the bread. Allow the glaze to set or cut right away. Such a wonderful combination of flavors. Plus it looks great! Thanks so much for your comments. I love a ‘kitchen sink’ recipe! Do you think this would do well with unsweetened coconut? It looks so good, but we don’t do much sugar, so I’d like to alter it slightly. Great looking recipe!! Most definitely, Kelly! I had sweetened coconut in the house and, therefore, used that. However, I think the bread will be just as fabulous with unsweetened coconut. My husband and son love coconut! They would love this cake! I love all the flavors in this banana bread. I made a similar (with rum too) Cooking Light recipe. Something about rum and coconut that is magical together! That delicious thick glaze is calling for me!! I love kitchen sink recipes too, and the combination of banana and coconut, this sounds wonderful! Thanks so much, Joy! I appreciate your comments.